Wireless power today is mostly about convenience; not having to fish out a cable and get it the right way round when you plug it in. But once it becomes ubiquitous, it will change the way devices are designed; they can have smaller batteries or save space by not needing the power port at all. 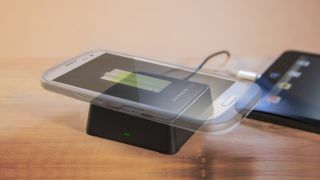 This year at CES, as well as seeing the latest wireless power products and the next step in wireless charging technology, we also got some good news on getting more users and businesses on board with wireless power - 2014 will definitely be a big year for wireless charging. There are over 60 different phones that have Qi wireless charging (the inductive charging standard) built in today - and 40 million of them have been sold - and because it's a standard, you can put your phone down on any Qi charging surface and it will just start grabbing power. If your phone doesn't have Qi built in, Incipio introduced a line of wireless charging pads and protective cases at CES that add it (including Lumia models like the Nokia Lumia 920 and Nokia Lumia 1520 that have a connector designed to simplify adding a charging case). That surface doesn't have to be a pad on your desk either. It could be a light or a mouse mat: silicon valley startup Kudos Tech had prototypes for both, although no dates for putting them into production yet. You don't have to only charge a phone; IDAPT has added a Qi charging module to its clever Modulo battery system, which lets you connect up to five external 2000mAh batteries to charge your phone or tablet. Snap on as many batteries as you need to take with you and drop it onto a wireless charger to keep them topped up before you leave. Or it could be a car cradle (Nokia has a wireless charging cradle already and Tylt was showing off a prototype of its own at CES, with a perpetually sticky surface to hold your phone in place) or a tray built into your car. Both have NFC which can trigger your phone to launch a specific app, like GPS navigation, or pair with the car's Bluetooth automatically when you start charging it. Car makers like that, John Perzow of the Wireless Power Consortium says, because it will let them take information from your phone – like your personal music collection – and display that on the screen on your dashboard. "They want a path for extending your personal device into the car and shifting some of the load to your phone, but you can only do that if you can charge the device." The Jeep Cherokee will have a wireless charging shelf in the 2014 model, Toyota will put it in the Avalon and Prius and the German auto consortium that advises Mercedes, Volkswagen, Audi and BMW is recommending Qi, after a three year study on wireless charging. We even saw an FAA-approved wireless charger for use on planes; expect to see it in private jets first rather than on your next economy flight though. So with a standard like Qi and products already in the market, why is wireless charging still not common? Perzow says that confusion over standards has been slowing adoption. Yes, there's the Qi standard, but there have been plenty of other wireless charging launches that haven't been part of Qi. Even Qualcomm has its own wireless charging system for electric cars (it charges the motor, not your smartphone, but still, it's something else to confuse people). The WPC is trying to tackle that by bringing new wireless charging developments into the Qi standard, and we saw some of that at CES.